Make Valentine Press Cookies with buttery dough pushed through a cookie press using a heart-shaped disk to form the cookies. You can change the cookie press disks to produce different cookie shapes, depending on the season or occasion. 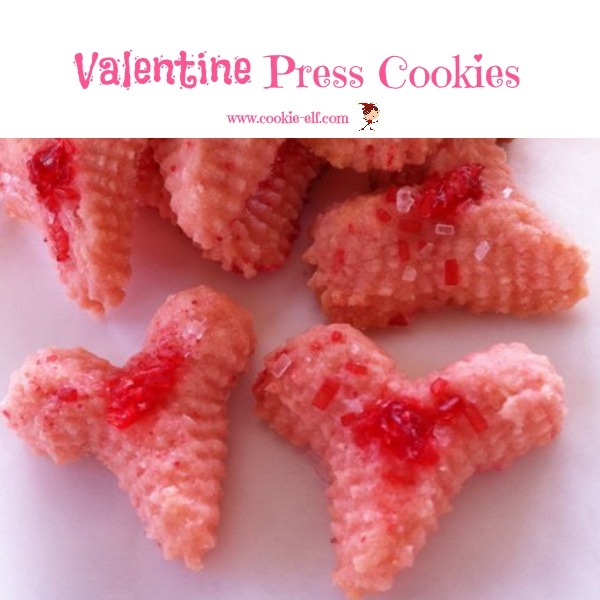 Yes, most cookie presses come with heart-shaped disks that are perfect for making Valentine's cookies Add a drop or two or three of pink or red food coloring and sprinkle the cookies with nonpareils or decos. You can serve these cookies plain, sprinkled with decorations or sugars, frost them, or dip them in melted chocolate. Press cookies are fun! In a medium bowl, combine flour and salt. Set aside. In a separate bowl, using an electric mixer on medium speed, cream butter and sugar until light and fluffy, scraping the bowl continually, about 1-2 minutes. Add egg and vanilla extract. Mix until combined. Reduce speed to low. Gradually stir dry ingredients into creamed mixture a bit at a time until well blended, scraping the bowl constantly. Add food coloring to dough according to your preference. You may wish to separate dough and color it in two or more batches to make a variety of red, pink, and white tinted cookies. Prepare cookie press by selecting and inserting a heart-shaped disk and filling the press with dough. Press cookies onto the baking sheets, about 1 inch apart. Decorate cookies with chopped cherries, colored sugars, and sprinkles. Bake cookies for 6 minutes or until set. If you bake too long, edges will brown quickly. Remove baking sheets from the oven. Allow cookies to sit on the baking sheets for a minute. Use a spatula to transfer cookies from the baking sheets to cooling racks. Valentine Press Cookies can be decorated with different kinds of red, pink, and white sprinkles to make a variety of colored hearts.